We’re striding along the Ku’ Dam, the chic shopping boulevard that make the Champs-Elysees look downright frumpy, ogling forward fashion bastions as Berlin marathoners storm by. From our nearby hotel, the uber-chic Intercontinental, I spy the miles-long Tiergarten, Berlin’s ‘green lung’, anchored by the city’s world-class zoo. 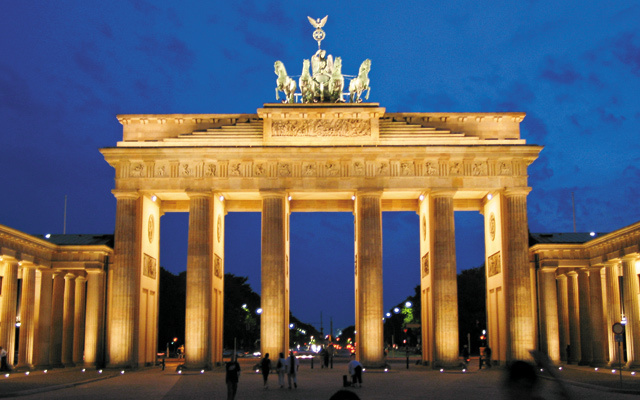 Beyond it looms the iconic Brandenburg Gate, dividing West from East and once again the symbol of the united city. During the era of Occupation, the Russians muscled control of the historic and cultural treasures clustered in their Eastern Zone. With those bleak decades over, today East Berlin has become the buzzing boho sector of the city, where Berlin’s pulse races fastest and most of the “good stuff” is found—starting with Unter der Linden, the avenue of the arts, with the University (Einstein among its alums), the Opera House, the patrician Cathedral, and the treasures on Museum Island alongside the River Spree. 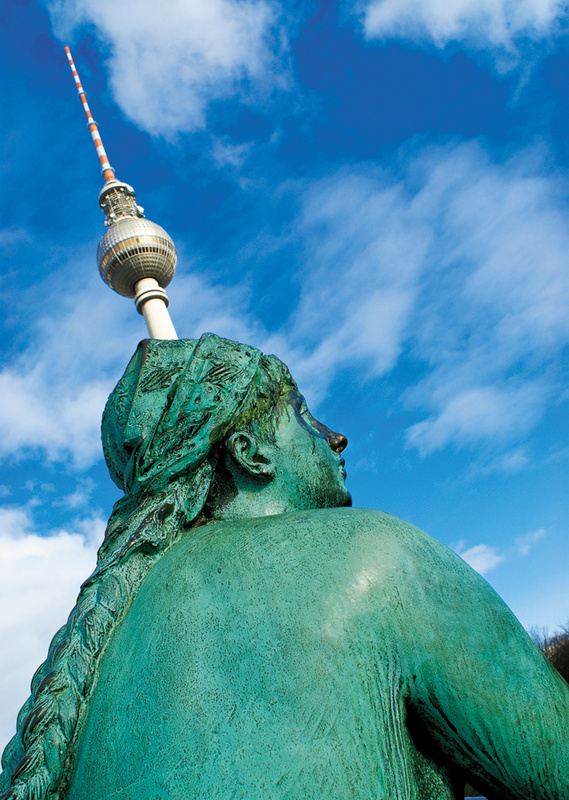 Across the avenue stretches Alexanderplatz, anchored by the Russians’ landmark TV Tower. It overlooks the city’s oldest building—St. Nikolai Church of 1230, and its equally venerable counterpart, St. Mary’s, with medieval frescoes depicting a jaunty red Devil leading the Dance of Death. Life, not death, is celebrated 24/7 in the once-Jewish, working-class quarter called Prenzlauer Berg. Under the railway arches that divide it from its more proper neighbors, it’s a magnet of all things hip: shops of vintage-wear, modern galleries, indie boutiques where you can snag a shocking-pink “safety belt” belt or handmade Nouveau kitchen tile, socks for your chair’s legs, Scottie dog stereo speakers, bike seats as animal heads. The golden dome of the New Synagogue of 1805 still glitters, spared, on that chilling Kristellnacht that kicked off the Holocaust, by a brave precinct politico, today open to tour. Another somber sign of Occupied times are bits of the Wall and Checkpoint Charlie, where today a museum makes real the deadly no-man’s-land between sectors of the city, and the daring attempts at escape—via balloon, car trunk, even cramped into a dog carrier or suitcase. Even grimmer: the must-see Topography of Terror Museum, with photos and quotes from the Nazi reign of horror: humiliations, round-ups and detention camps, speeches by a “heiling” Hitler. Here stood the feared headquarters of the Storm Troopers and Gestapo. The Holocaust Memorial near the Brandenburg Gate pays respect via scores of somber, gray slabs. Close by lies Ground Zero: the site of Hitler’s bunker. This year, the stories of those reviled by The Fuhrer are told on pillars throughout the city memorializing “Destroyed Diversity”—the hounding of Jews, gays, artists, writers, teachers—anyone who didn’t fit the mold. But today, it’s a far happier story, as Berlin celebrates the energy that its “alternative” populations add to the city. And the food? Forward, too—as in a firmament blinking with Michelin stars, including the Intercontinental’s, evidenced in desserts like mango panna cotta and rotegruten (red berry) sorbet. With tables sprawling into the green Tiergarten, am neuen See treats slugabeds to breakfast until 3 p.m., where they can choose Berliners’ favorite pizza, flammenkuchen, topped with cream cheese, ham and onions. For me, lovely local trout. At Leibnitz Klaus, the hyper-local clientele hasn’t changed for decades, and neither has the menu. I pigged out on an item rightly called “super pork hock”—served with kraut, boiled potatoes, horseradish and spicy mustard. Saner table-mates attempted meatballs of basketball girth, and wine-scented sauerbraten. Later, homemade apple strudel. And beer. Tuchovsky, since the Twenties a hangout for literary types, also produced plates Wagner’s hefty heroines might envy: liver and onions, schnitzel, rouladen. More pork. More potatoes. And, of course, more beer. 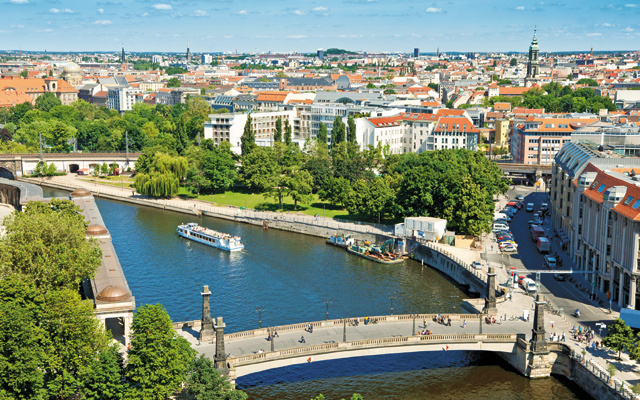 Berlin is not only a wonderland, but—bonus!—an amazingly affordable city. And a welcoming one. The Pink Pillow Collection notes hotels (including the Intercontinental) that particularly cherish gay clients (www.pinkpillow-berlin.com). Visit www.patroc.com/berlin/gayguide.de for everything from clubs to events, like June 22’s Christopher Street Day. Check www.visitBerlin.com to plan your stay. More good news: Air Berlin has just launched state-of-the-art nonstop flights direct from Chicago (free everything, from alcohol to movies). So, what are you waiting for? 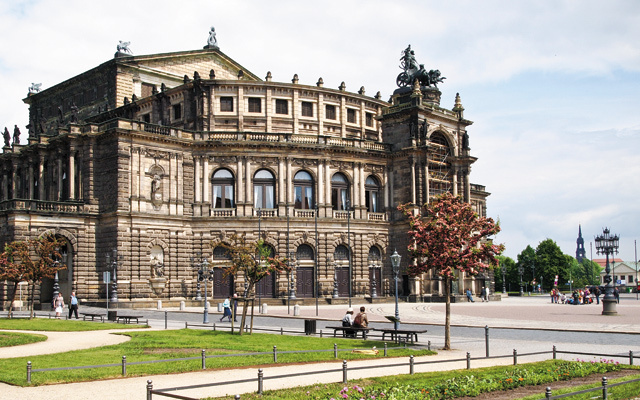 Talk about Quality of Life: as the apex of architecture, art and music, Dresden—a two-hour train ride from Berlin—became known as “the Florence of the North” and “the balcony of Europe.” Honoring those treasures, the Allies left it untouched—until the final hours of World War II in 1945. Then, it was carpet-bombed—not once, but three times in quick succession, to destroy Germany’s last shreds of morale. The entire city lay in ruins. Today, it’s once again a culture-maven’s paradise—meticulously rebuilt to emulate its Baroque glory, a city of sculpted stucco and golden statues atop a sea of graceful domes. Folks once again stroll the expansive promenade along the River Elbe, where, in the dark days of Nazi rule, signs decreed “No Jews Allowed.” The nearby synagogue was devastated on that infamous night in 1938. Today, however, a modern temple marks the spot—new, because “the old cannot be replaced as if it never happened,” explains a guide, who points to the Star of David embedded in its façade. “A fireman found it in the ashes of the old temple and bravely hid it all during the war.” Today, benches along the promenade are emblazoned with the message “Speak Up!” to underscore that this must never occur again. Dresden’s beloved Frauenkirche was shattered, too. The city’s landmark church since the 17th century was rebuilt in 2005 with restored glory. Workers, clearing off the bombing’s rubble, unearthed the ancient steeple cross, which shines anew. Near it stretches the Jousting Court, where armored knights did combat. And that intricate, block-long mural? That’s the Procession of Princes—a life-size parade of 800 years of rulers, composed in tiles of porcelain, for which the town is famous. Close by looms the elegant palace, erected by Augustus the Strong to one-up Versailles. Today, museums line its garden, climaxing in the famed Green Vault: eight chambers, all glittering gold and shining mirrors, housing Augustus’s treasures of ivory, amber, silver, gold, and countless jewels. Other once-royal edifices now hold more treasuries of art. The Old Master’s Gallery boasts a who’s who, from Rembrandt and Rubens to Durer’s Dresden altar, and… what’s this? Raphael’s famed “Sistine Madonna” with those often-copied simpering cherubs, “borrowed” from under the Pope’s nose. The Albertinum continues the roll call with modern works—Manet, Degas and Picasso sharing walls with Warhol and Pollack. The Semper Opera House (home also to the orchestra and ballet) staged premieres by homeboys Richard, Wagner and Strauss. Our home was the contempo Innside Hotel, just a baton’s throw away, where a meal of tuna tartare; coddled egg with pea puree, smoked eel jus and caviar; and Wagyu beef crowned Dresden as a dining Mecca, too. Hungry for more? Visit www.marketing.dresden.de.